Leptron's interactive training experience builds UAS aviation confidence with specific content and professional UAV flight instruction. Leptron's professional pilot instructors have more than 50 years of combined aviation experience. Sign-up today, class sizes are limited. Watch Leptron Avenger Helicopters and RDASS Quadcopters in action! Leptron Unmanned Aircraft Systems innovates, manufactures and distributes patented, unmanned technology which can be piloted remotely using advanced ground station products. Leptron's unmanned aerial systems (UASs) are certified for airworthiness, manufactured in the USA, and include pilot training. Leptron's lean manufacturing facility is ISO Certified and meets OSHA safety requirements. Leptron technologies are now available for commercial, public and private applications. On-site maintenance and repair ensure your equipment is operating at peak performance and ready for your next assignment. With decades of aerospace experience, Leptron leads the industry in sensing technologies that are cutting-edge and adept at efficient solutions. 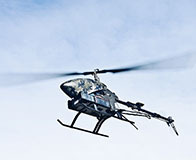 The Avenger™ Helicopter is an innovative platform that creates a mobile high-performance system for high or low altitude surveillance, aerial photography and sensor management. Leptron's patent-pending design is designed specifically for industrial use and maximum flight time with minimum down time. The MicaSense RedEdge-M™ is an advanced, lightweight, multi-spectral camera optimized for use in small unmanned aircraft systems. 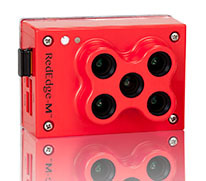 RedEdge-M provides accurate multi-band data for agricultural remote sensing applications. 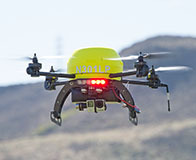 The Rapidly Deployable Aerial Surveillance System (RDASS) Quadcopter is a innovative high-performance system for high or low altitude surveillance, photography and sensor deployment. © 2015-2017 Leptron Unmanned Aircraft Systems, Inc. All rights reserved.